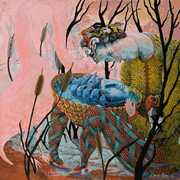 The imaginative works of mother and son artists Eleanor Spiess-Ferris and Michael Ferris close out the season. Eleanor’s lyrical drawings and paintings will serve as a backdrop for Michael’s vividly colored constructed sculpture busts. Her elegiac depictions of birds and fanciful watery realms serve as symbolic representations of the human comedy. Michael creates figurative portrait sculpture out of recycled wood, contrasting the stoic and classical physical composition of the subject with its complex multi-patterned surface.